Integrate a flash news scroller with dynamic news ticker into your site. 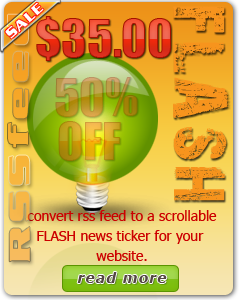 Flash Scroller converts RSS feeds to a scrollable news ticker vertical or horizontal style. iVideo Elite is a multi flv player. It is customizable & flexible widget/video that you can put on your website. It is easy to create a multi videos menu via one external xml file. The clip can be played by selecting the title through the scrollable thumbnails. what each video is all about. What do you get when you purchase this script? The flash script you can use for as many website as you wish. The Flash iVideo Elite script with sample. Read me documentation, embedded and install instruction. iAccordion horizontal is a "banner sliding menu". It is easy to create a beautiful accordion menu for your website. It can be set to click through to various URLs. When the mouse moves over the banner it pauses and the information scroll up from the bottom to the top. Banner menu is expandable automatically or by mouseover. Smooth animation effect movement's horizontally. The Flash iAccordion Horizontal script with sample. Use any color for the background of your choice. It can be set via XML file. The Flash iConveyor script with sample. The Flash iEvents Scroller script with sample. The Flash Dynamic Mutiple Feeds Scroller script with sample. iBanner Elite 2 an automatic slideshow and banner rotator 2in1. It dynamically displays standard images as a slideshow with transition effects movement. The slideshow can be manually viewed by clicking the previous and next button. 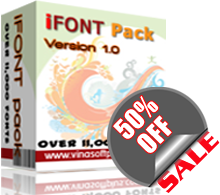 This flash script can be easily integrated into any website. You control the slide delay, speed, text formatting, navigation buttons and caption on or off. All settings and configuration via one XML file for easy maintaining and updating. What can do you do with this script? Model agency uses it to show the model profile.. Creating web banner slideshow presentation. Photographer uses it to display their portfolio profile or show case. You can use it for advertising, promoting or rent out as space ads. RSS feed can be pull from other website like Yahoo, Google, BBC, etc.. The Flash iDynamic Typing 2 Scroller script with samples. The Flash iDynamic Vertical 2 Scroller script with samples. The Flash iDynamic Typing script with samples. iDynamic Vertical Scroller script (scroll Up or Down) is an innovative scroller that uses PHP script to parse any external RSS feed and displays on your site. It loads and update news contents automatically and far beyond! The Flash iDynamic Vertical Scroller script with samples. iDynamic Horizontal Scroller script (scroll Left or Right) is an innovative scroller that uses PHP script to parse any external RSS feed and displays on your site. It loads and update news contents automatically and far beyond! The Flash iDynamic Horizontal Scroller script with samples. iNews Scroller Vertical script is a news item solution for displaying news on your webiste. It loads news with thumbnail images from the external XML file. You create XML news with title, description, thumbnail image. Portfolio profile or show case. The Flash iNews Scroller script with samples. iNews Switcher script loads news with thumbnail images from the external XML and displays on your web page. You create XML news with title, description, thumbnail image. Uses as company lattest news update. Company uses to display their portfolio profile or show case. iBanner Elite's a glamour banner rotator and auto slideshow 2in1. 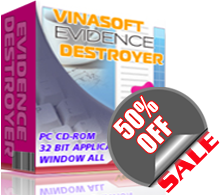 It dynamically displays standard images as a banners or as a slideshow using impressive of over 100 transition effects combination. The slideshow can be manually viewed by clicking the previous and next button. Model agency uses it to show the model profile. Flash Photo Portfolio is a photo gallery that uses XML file to store the information about your photo and which thumbnail to display. The gallery is easy to config and update. All setting and configuration is made via an external XML file. Creating web photo slide show presentation. Displaying a client show case examples. This is flexible xml static scroller. It loads data from an external XML file and display them as a scroller on your website. This scroller can be set to scroll from left to right or from right to left. Rent out as ads space for extra revenue. iNavScroller is a 3D scroller navigation likes menu. It loads images from an external XML file and displays them as thumbnail in 3D scroller style. The url link is attached to each image and target it to open link individually. For example like opens it in the same browser or opens it in new browser that is your decision of how to config it. Also there is a caption to set for each image and displays it on the top of the image and align it at the center of the space. You can use it as a quick navigation menu. Rent it out as an advertising space. Creating small portfolio slide show. Dynamic Vertical news ticker with continue scrolling from the bottom to top. When mouse over the ticker it stops scrolling and zoom in effect appears. The look and feel of the ticker is completely configure via an external xml file. Dynamic Vertical news ticker with the item is scrolling from the bottom to top and pauses. The look and feel of the ticker is completely configure using external xml file. Dynamic Vertical ticker with the news title is scrolling from the bottom to top and pauses. The look and feel of the ticker is completely configure using external xml file. This ticker just displays news title as a single line no description. Dynamic Vertical news ticker with zoom in effect and pauses between two items. CT Airlink offers CT Limo Service CT to LGA and Limo Service CT to Boston Airport, JFK, LGA, Newark Liberty Airport (EWR), Manhattan, Hartford Bradley Airport and New York City. CT Airlink arrange Limousines for Limo Service in CT to JFK and Limo Service CT to NYC from Greenwich, Danbury, Bethel, Southbury, Brookfield, New Milford, New Fairfield, Kent, Roxbury, Litchfield, Southbury, Middlebury, Woodbury, Waterbury, Watertown, Waterford, Torrington, Newtown, Redding, Ridgefield, Weston & Wilton by CT Airlink. Join our affiliate making up to thousands of dollars per month by selling our products.